Printing Errors / Increased Value? Hey everyone! I've never posted on here before, but I have a pretty interesting question. I bought the new SuperHeroes Two Face Chase set yesterday. When I pulled out Two-Face, the "normal" side of his face was printed in lavender. All the pictures I've seen have this side of his face printed in black. I contacted LEGO and they are sending me a replacement. Anyone else have this odd occurrence? ALSO, is there any sort of market for printing errors - especially one on such a well known figure? Thanks!! I don't think they're worth anything unfortunately, just curiosities. 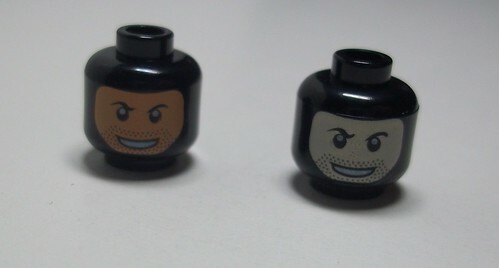 Oddly enough I've been sitting on a lot of misprinted heads from Lego Studios sets. I have one Steven Spielberg head which is missing its beard and an Evil Ogel whose face is neutral instead of scowling. I think misprints or errors would be worth less actually. I would also consider LEGO printing errors to be worth less, although they could still be used for some purpose. It's not like when sports cards had "error" versions that were considered to be worth more to collectors, LEGO printing errors are just ones that got by quality control. "Error" cards were part of an identifiable limited run before the producer changed how the card was printed for the remainder, and usually larger, print run. I believe card makers sometimes did this on purpose to sell more product. Does anyone know if there are two printings of the S5 CMF Royal Guard? I now have 20 of these, and to me it appears that there are two different printings. On 16 of them, the inside of the belt buckle is fairly dark grey, and can be seen from all angles. On the other 4, it is almost silver and virtually disappears when viewed at a large angle. I have also found that some of the bearskin caps have different sized interiors, so that for some minifigs the eyes are very slightly covered, whereas for others the eyes are fully visible. It only really shows up when you stand them in a row. But it is probably a court-martial offence. I think the hat/eyes things is actually a printing issue with the face printing too high. I don't know for sure but remember this being discussed. Do the ones with the dodgy eyes also have the dodgy torsos? I wouldn't class these as variants as such, but it's worth keeping an eye purely just for quality value. There are a couple of CMFs that have had varying print quality throughout their production run. I think it is down to the hats as if I switch the hats around then the covered eyes become uncovered and vice versa. It's not by much, probably just 0.5mm, but it does show when they are on parade. Hey all - just a question about the 2012 trooper head. I've bought six of the 9492 TIE Fighter sets (and a couple of other sets that have the newly designed trooper head), but much to my surprise today I noticed something different about the TIE Pilot's head. The previous five all have the same pale face (on the right), but this one looks like he's been out in the sun a bit (on the left). Collectible thoughts? Think they are going to start moving the pale faces out of production? Or is this a misprint or variant? Cool... almost too cool to cover with a helmet! One other thing to point out from the 9492 set, two of the somewhat bigger pieces that were previously in bags were loose in the box. This leads me to think that this is a new version of the TIE Fighter. The trooper head was the only other difference I could find in the set. Hah, I thought the same thing! I LOVE misprinted Legos and oddities. They seem pretty hard to find. They show up sometimes on eBay. Wish BL had a spot for them. I also have the two-face chase set with the same issue AND a chipped off hand. I guess that means we're twins. I don't think I've ever come across a part with a decorative misprint in any set I've purchased, but I would be a little miffed if I had. However, I do have a few of this piece (http://www.bricklink.com/catalogItem.asp?P=30000) on which the LEGO logo on one of the studs is opposite of the other three. I got one piece with this misprint in each of the three copies of set 7146 that I have. The other three parts like this in each of those sets were all normal. Misprints and mismolds can actually be quite collectible. For instance there are at least three different Black falcon torso prints where the colors have been flipped or in some cases the whole print is mirrored. If you peruse these minifigures on Bricklink, they usually appear at the end of the listings as they are the most expensive of the bunch, and they are identified in the descriptions page. If the color discrepancy of the stormtrooper has happened in any significant number, Bricklink might list it separately, in which case it will be of great interest to completionists and the price will increase. Just look at the price of the smooth-haired Leia minifigure, it's quite valuable. I had this head too. It's good to know I can get a replacement. I've bought a few discontinued sets on eBay with misprints. Unfortunately, I can no longer get replacements for those. I've just picked up a S7 sleepy head and noticed that he only has a yawning face, not a sleeping face on the back. All the other ones I have have got the dual sided face. Has anyone else had one of these? It is new out of the packet. In fact, on closer inspection, both sides of the head have been printed on the same side only. He has a double thick eyebrow and a slightly skewed eye, and I can just make out the brown chin line at the side of his mouth. LEGO misprints have been around since the very first LEGO printed parts... the 1955 introduced (for the Town Plan System) 1x6 and 1x8 named beams. Some old and new misprinted items are worth more... and some worth less or the same. It all depends on the type of misprint. 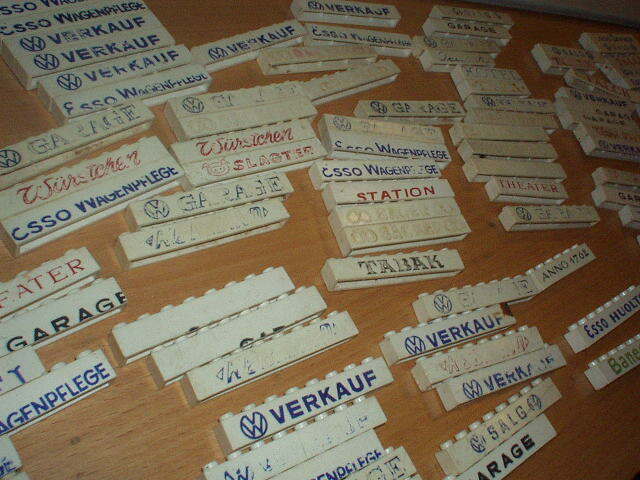 Here are pictured some of the very first misprints of 1955-60 (mixed in with regular printed bricks)... in Danish, German and Finnish... (image from the LEGO DVD)... sold to LEGO employees very cheaply as factory seconds. I only recently discovered (rather embarassing) that my Kit Fisto minifig was a printed black torso with brown arms and not brown/brown like it should have been. Only found out because I sold it to someone else who noticed and wanted to know what was up with it. I contacted Lego about the Sleepyhead head. They are going to send me a keyring. I find it strange that they cannot supply parts for CMFs. They just say that they are random and cannot tell what is in each bag. For replacement parts where quality control is lacking, I would have thought they could open the packs, or use the bump codes / feel them like everyone else! I believe the way that replacement part fulfillment works is that they don't have spare *sets* laying around, but have explicit parts. The way it worked in the USA (when they still did part fulfillment in Enfield) was that they had a HUGE number of cabinets with drawers, which are supposed to be "up to date" with the current lineup of sets, containing all of the currently available parts and colors. But of course, it's not always guaranteed-- some things just don't get put in there, and others get used up by other customers. In *THIS* case, because the parts are manufactured in China, they probably don't get the same replacement parts sent to Denmark, and probably don't have an equivalent department in China. The other option you mentioned (which is to send a replacement set), DOES work in most cases, but not in this one. Whoever you're on the phone with (or was answering your email) probably has the authority to effectively place an order for a replacement set for you. But they can't put in any "special instructions". So they could order you another 8827 set, and that'd be just fine. But they don't have a way to make sure that the person who's filling the order can actually guarantee that it's a PARTICULAR 8827 minifig. So, it's not really that the company *couldn't* do it if they really wanted to-- but more along the lines that their internal infrastructure doesn't have a mechanism for it. The person on the phone doesn't have that ability directly, so they're offering something that they CAN offer, to hopefully satisfy you. But they can't put in any "special instructions". So they could order you another 8827 set, and that'd be just fine. But they don't have a way to make sure that the person who's filling the order can actually guarantee that it's a PARTICULAR 8827 minifig. I am satisfied, they offered me either a key ring or a replacement S6 or S7 packet (blind). I chose a Yoda keyring. All I really wanted was the correct head but I'll either buy one on BL or change him from sleepy-head to never-get-dressed-and-sits-and-watches-TV-all-day-man. They could send a replacement if they either opened the packets, or used their internal identification system (the bump codes) to identify which figure is in the packet. We can check bump codes on packets, so why can't they? Why are they there if they are not used by Lego? I believe they're used for identification for packing-- so they're machine-readable, but not easily readable by humans. I would expect they're put together in boxes pretty quickly after being bagged, and once that's done, there's probably no "unmixing". And it's true that the company COULD use the bump codes, or feel the packaging, or whatnot-- but whoever you were dealing with couldn't do it themselves. They'd have to ask their manager who would probably have to ask a different manager, who would have to find someone on the floor to do it, and then cross-check the system manually to make sure the right order was getting filled. Basically, too much work given their current setup. Ideally, they'd keep a selection of replacement figures separated for situations like this, but I don't think LEGO's really dealt with enough support calls of this nature to have a good procedure in place for things like this that are randomly bagged. They may also have decided at some point in the process that they would *never* do anything like that, so as to help encourage and guarantee randomness. I also wonder how it happened. Until now I have never seen a two sided head printed incorrectly, they are nearly always perfectly aligned, opposite each other. This one is perfectly overlapping. So I wonder if they are printed, then spun around and printed on the reverse and this time the spinning didn't occur. It does remind me of the old joke that all the heads are printed on the wrong side, but I just turn them around. Way back in 2002 I had a Lobot with a head that was misprinted (I still do have the head somewhere). The printing that was supposed to be on the back of the head was along the side, starting near his eye and wrapping along the right side of the head instead of across the back of it. It's possible that the turn didn't occur because the piece failed to pick up to be spun or that the piece dropped back slightly irregularly and rattled out of position (which could account for my Lobot being 90 degrees out of position, not 180). Without seeing the machine that handles this aspect of printing I couldn't say. Anyone seen it in action? In case anyone is wondering this is what my sleepyhead's head looks like. There is nothing on the back, you can clearly see the double eyebrows, the extra bit by his right eye and the brown mark on the right side of the tongue. The alignment is obviously just about perfect, since most of the features overlap, suggesting the lack of a 180 degree rotation. I love stuff like this since I mainly collect minifigs. I'm looking to buy any fig variations anyone might have. I look for any figs that were made by Lego with alternate colors, missing colors, any manufacturing error like the ones below. Fig A has two colors flip-flopped. The left one has a blue shirts/camera and a yellow lens, while the right one has a yellow shirt/camera and a blue lens. This is the result of the ink cups being filled out of sequence. Fig B shows an example of mirror image faces. This is the result of mask that is used to make the cliche, (the printing plate), being flipped over before etching. ^ Interesting! So would the sleepyhead above have any value, more than the 30c or so it would cost to buy a correct one? It nearly went in the kids' box for playing with. Coming from a background in Hot Wheels, which has a huge community of variation collectors, I would consider the sleepy head an error as opposed to a variation. Errors are desirable as well. Tampo variations are really cool because they're like production pieces with no failures of form but are on the scarce side usually. 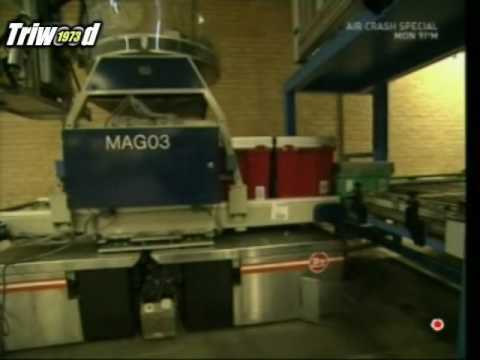 It's likely the machine set-up technician would have caught his error relatively quickly and fixed the problem. The affected parts just go there merry way. Hot Wheels has perfected the variation thing by intentionally flip-flopping colors to force variation collectors to buy again and again. Lego has their way of doing the same thing with part colors, hair, capes, accessories, etc. Value…the Lego community hasn't begun to value variations/errors of minifigs any different than regular releases. They may never. I do, so I'd like to pick up whatever I can find. I'd like to buy/trade for the misprinted sleepy head if it's available. Let me know what you need for it. Maybe I have a fig that you need. @recordman I find this very interesting. 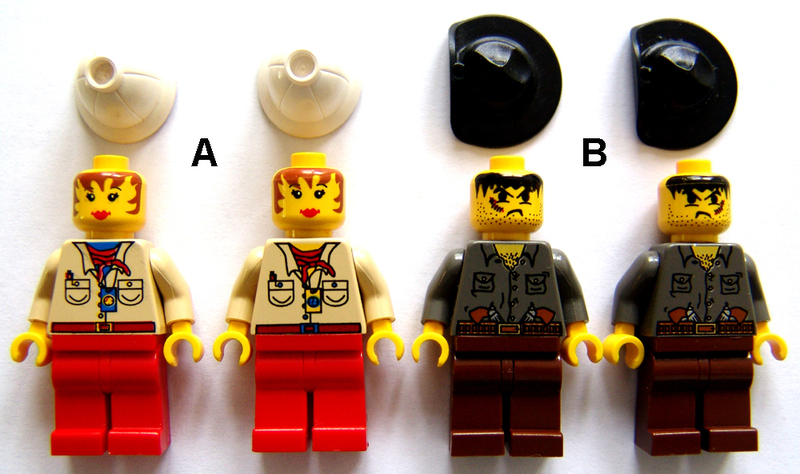 Do you have a blog or flickr that highlights your collection of minifig variants? Or perhaps there could be a separate thread here for people to post minifig variations / errors that they find. I think that would be enjoyable to see. No blog or flickr. Right now I just look for Lego wherever I can. I search the greater New York area at all the usual places, flea markets, garage sales, etc. I am a stay at home Dad so I get to do Lego for as many hours a day that I want. I've been into Lego 5-6 years now and have about 2000 figs, about 800 unique. I don't have that many variations yet, that's why I'm asking everyone here what they might have available. Normally I wouldn't come out and advertise this for fear of driving up prices. But with Lego, I felt that collecting variations is relatively new to folks and pricing isn't a big issue. I'd rather trade anyway. I'm moving soon and when I get situated there are several things I want to do with the figs regarding storage and display solutions that this community may be interested in (I hope). In a similar line of thought, is there any value to misprinted or misbound instructions? One instruction book of my Imperial Shuttle 10212 was missing 16 pages and had 16 duplicate pages. Customer Service sent me a new one, but is there any use for the erroneous book? is there any use for the erroneous book? Yes, but what will you pay for it? I have just built set 9496 Desert Skiff, and the Boba Fett came with a Lando guard helmet! The funny thing is, the Lando figure also had an error, as it came with the Boba helmet. Could they be worth anything?